It’s a beautiful day here today, the wind has dropped and the sun is very, very warm. As we are stuck on the campsite today (waiting for a mechanic!) 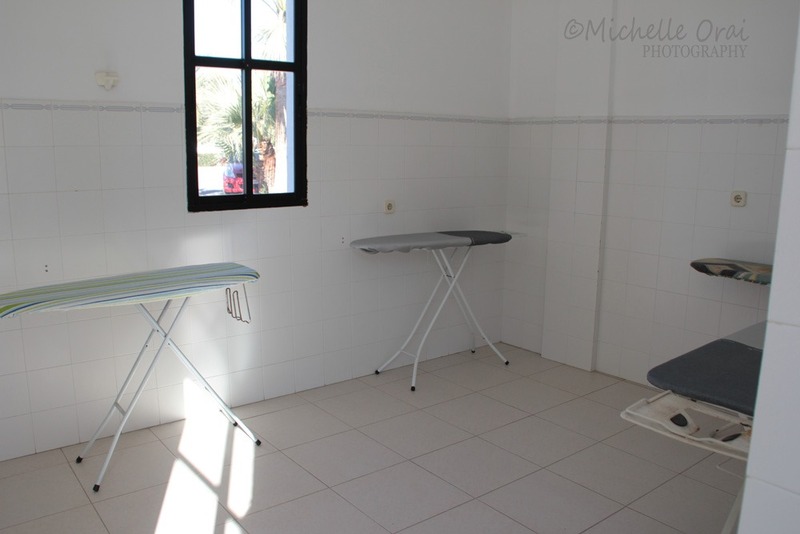 more on that later, I thought I would write a post about Laundry Room Etiquette whilst motorhoming. The very first thing you have to come to terms with when motor homing is that there are certain facilities you ‘have’ to share with total strangers, loos, showers, chemical toilet emptying stations and the washing machines. Sounds delightful doesn’it? We are quite lucky in that we don’t need a washing machine all that often, we are mostly wearing shorts and t-shirts and all of our every day wear can be washed by hand, we do it on a regular basis which means we don’t get a build-up of bags of smelly dirty washing. Tea towels get washed every other day as do the dishcloths, flannels etc. Washing and Ironing? I draw the line at ironing! 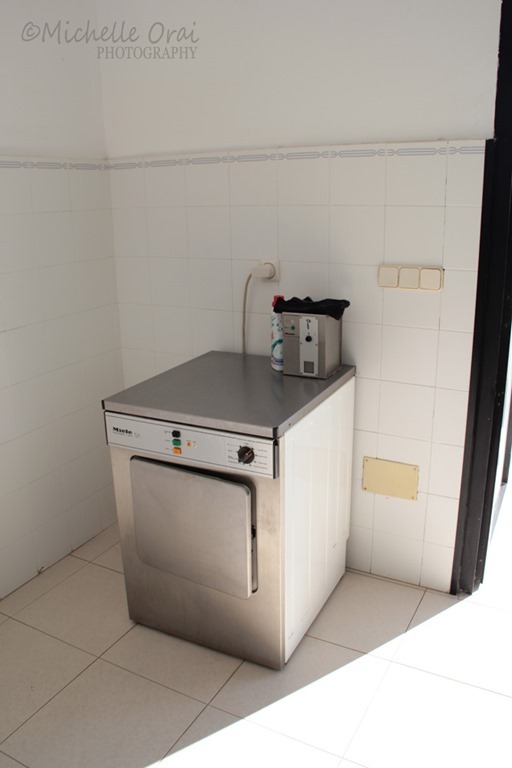 Let me describe a typical laundry room at a Spanish campsite; they are normally located close to the reception, they have tiled floors and normally have 3 or 4 industrial looking washing machines (some front loaders and less seldom top loaders) and maybe 2 tumble dryers. They are operated either by inserting cash but more usually you have to purchase a token at reception (prices can range from 3 – 4 Euros). Some machines include detergent although we’ve only seen that once and made the mistake of not reading the instructions properly and ended up with a machine so full of bubbles!! I thought it would explode, cartoon fashion, and flood the whole place!!! 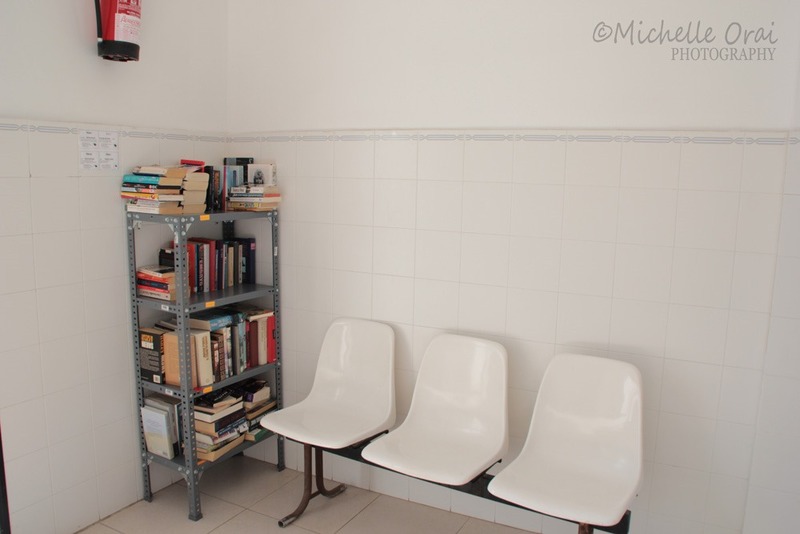 Most laundry rooms also double up as book swapping stations, there is always a huge selection of novels in Dutch, German and English. I picked one up at Cabopino, and I’m only on Chapter 3!!! It’ll probably end up in a Charity Shop back in the UK unless I apply myself! There are always rules and regulations with regards what you can put in the machines, firstly by weight, how on earth you can possibly weigh your dirty washing in a campervan escapes me but it’s usually 5 or 7 kg max. 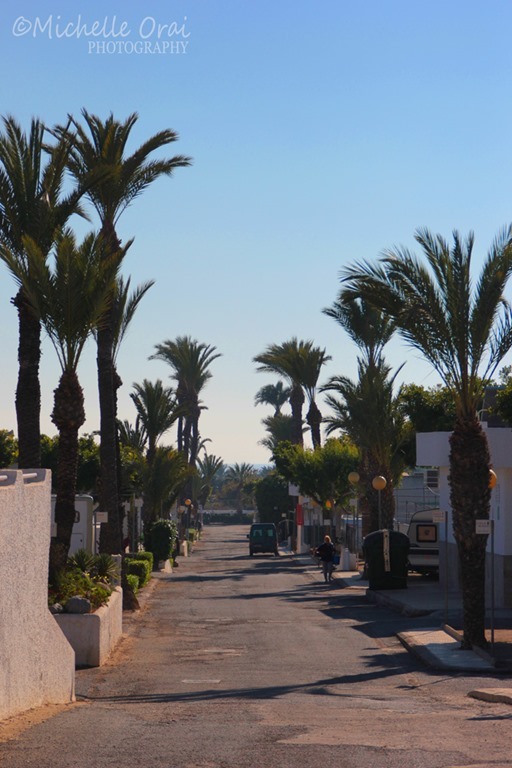 Then there are the more unusual rules, one we saw at Cabopino was no item that measuring more than ¼ of a metre could be put in the machine, hang on a minute that would be my pj’s or even a T-shirt! Needless to say that rule was broken on a daily basis, normally not causing a problem until we heard about a Dutch guy that put his duvet in the machine and burnt out the engine! I’m so glad that wasn’t us! 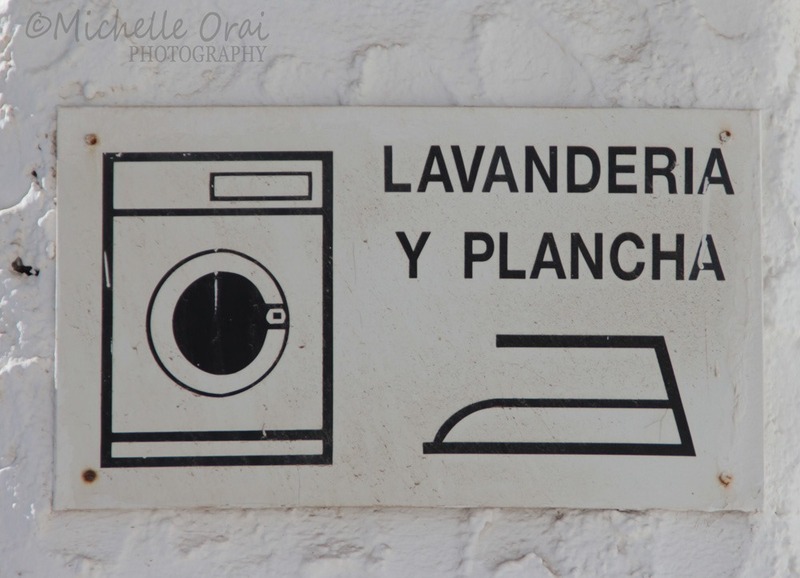 As for the people that use them, there is definitely evidence of a Weekly Wash Day over here, you can arrive on a site, no washing drying in evidence and a couple of days later there are lines of washing everywhere. What surprises us is the sheer amount of white knickers, white vests and handkerchiefs! Lines and lines of them all blowing in the wind as if some mutually agreed surrender is about to take place. Women go back and forth all day long, checking how dry the items are. I saw one woman who managed to fill a whole machine just with handkerchiefs, I mean, really how runny would your nose have to be to fill a machine full with hankies? As for the knickers, lines of 18 – 20 pairs, the way I see it, is that they’ve had a build up of dirty knickers in their vans for over two weeks, ughhhhh!! Well, we’re all different eh? Something I found quite difficult to do was to empty someone else’s washing at the end of a cycle to enable me to use the machine. A Dutch woman assured me this was quite acceptable behaviour, but honestly putting your hands into a machine and pulling out someone else’s smalls doesn’t lie easy with me and I don’t think I’d like the idea of someone getting their hands on my personal bits and bobs either! Another thing some people tend to do is to buy up tokens in advance, the situation arose in Cabopino whereby they only had 5 tokens left and they were in the trays in the machines!! People do the craziest things. Another trick that has been noted is to fill the machine with the dirty washing and THEN go and buy the token rather than buying the token first, some people will fill two machines preventing others from using them. It’s a very small majority of people that do this but I can only assume they also have very small, selfish minds too. For goodness sake we’re meant to be away from home in the sun and enjoying ourselves not monopolising washing machines!! Just one dryer here, there isn’t much call for them when the sun shines. 30 minutes later I return to see the machine has been emptied and it’s in full swing again but no worries the one next to it finishes in 12 minutes. So I place my bag and detergent on top of the machine and go back to the van. 10 minutes later I return to find a lady (I use the term loosely) gaily filling the aforementioned machine with her dirty washing and setting it off on a cycle. I grabbed my washing with as loud a huff as I could muster and waltzed out! I was not amused but being very British and not absolutely sure what the rules and etiquette were on this camp site, and of course not wanting to encounter a confrontation! I decided retreat was my best option! To be perfectly honest I wasn’t particularly fussed about getting the washing done, we hardly have a deadline, it was the attitude of the fellow camper that prickled me! 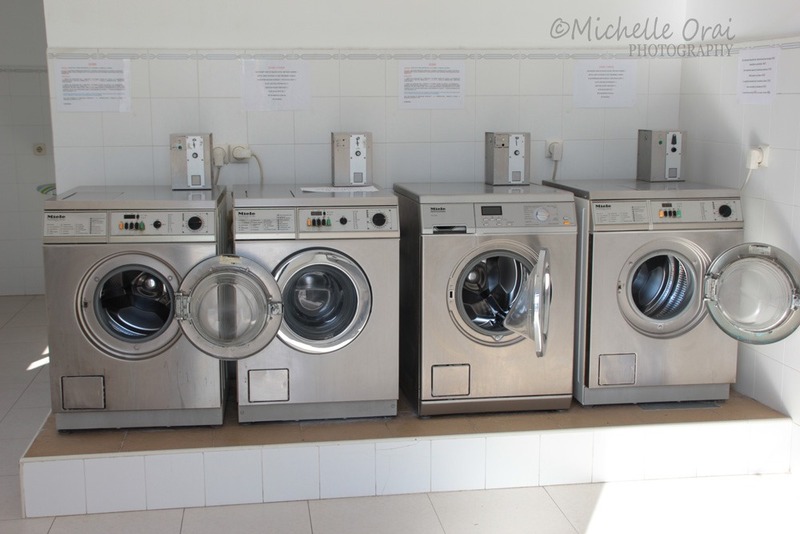 We returned to do our washing late last night and had our choice of machines, the washing was hung out last night and this morning it’s almost dry so looks like we may just have found the best solution – I mean it beats running back and forth to the laundry room during the day when we could be out and about enjoying ourselves! 4 ironing boards, I won’t be using any of them!! As for our mechanical problem or should I say Harry’s mechanical problem, the Hubster has said since Day One that he found Harry to be ever so sluggish in fourth gear. Coming down from 5th into 4th doesn’t seem to give him the kick he needs, especially when climbing the very hilly roads here in Spain. We chatted with Steve and Judy yesterday and they agreed it doesn’t sound right and as they recommended the mechanic that had come out to them the other day, we’ve given him a ring and he’s popping over today to see if he can solve Harry’s reluctance to climb hills!! I will of course keep you posted and let you know what happens next, either way it’s going to involve an added expense!! 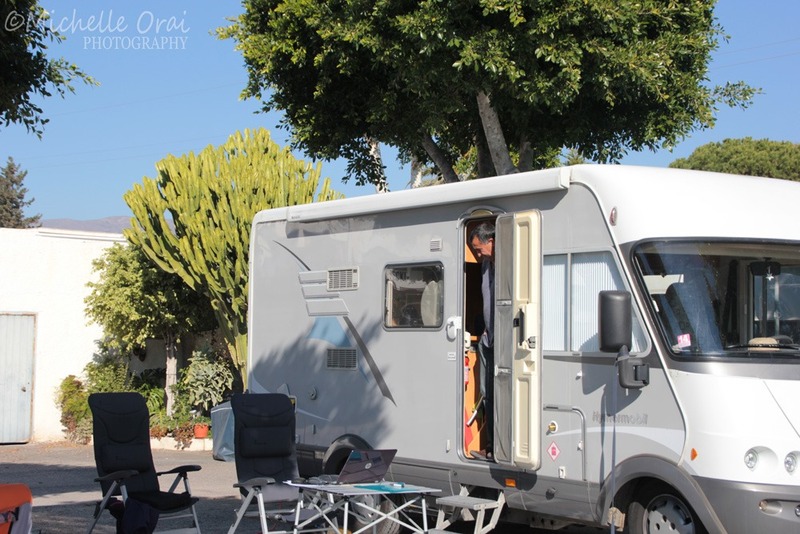 This entry was posted in Daily life, Hidden Gypsy, Hymer, motorhome, motorhoming, Motorhoming in Spain, Photos, Spain and tagged Camping La Roquetas, Campsite laundry, Laundry, Roquetas de Mar, Spanish campsite, Wash Day, washing. Bookmark the permalink. Goes to prove that most people are pleasant when it’s fun and games; true character is revealed in the less pleasant moments of life. Sorry to hear about the machinehogs. I’ll continue to enjoy your holiday through your eyes. 🙂 Hope Harry’s trouble isn’t too serious.